Earlier today, Jason Botchford (Vancouver Province) suggested the Sedin-Sedin-Burrows line was the second coming of the Westcoast Express line. Scratch that, he said that they are even better than the original. The trio have played 57 games together going back to last winter. In those 57 games, the line has combined for 73 goals and 119 assists for 192 points. That’s 3.37 points a game and is a pace which outdistances the best line in Canucks history. At its peak in 2002-03, the West Coast Express put up 3.31 points a game. And who can argue with him? The Canucks just disposed of the Phoenix Coyotes 4-0 to win four games in a row for the first time this season and at least catch the Northwest Division-leading Calgary Flames in points. Henrik Sedin had 3 assists to pass Joe Thornton in the NHL scoring race, Alex Burrows recorded his second hat trick in two games, and Roberto Luongo posted his 50th career shutout. First, the Sedins and Burrows. When Burrows signed his 4-year/$8 million, I admit I thought it would be a solid deal even if he simply produced 15 goals and 40 points; with 17 goals and 17 assists, he’s nearly cracked that mark and the season is barely over half a season old. It goes without saying that he is proving that I’m just a Canucks fan who set expectations ridiculously low so as not to be disappointed. To add to what Botchford said, the Sedin-Sedin-Burrows line is on fire. Combined, they have 130 points (48 goals and 82 assists) this season. Only San Jose’s (Marleau, Thornton and Heatley – 64 goals and 86 assists) and Washington’s (Ovechkin, Backstrom and Semin – 60 goals and 76 assists) trios have combined for more. When you take into account that Daniel Sedin missed 18 games due to injury, it makes what the Sedins and Burrows have accomplished so far even more impressive. Maybe they are the second coming of the Westcoast Express, but I’m not sure I like the nickname. Contest time: Suggest a nickname for the Sedin-Sedin-Burrows line and post it in the comments field. Richard, Alix and I will each pick one we like and we’ll send each winner a copy of the Vancouver Canucks 2009-2010 yearbook. Tonight’s shutout was his 3rd of the season and 50th of his career. He is now tied with Chris Osgood for 2nd most career shutouts among active goaltenders. He is 56 shutouts behind Martin Brodeur’s career mark, but as you know, Luongo just signed to play for 12 more years. In Luongo’s first 3 seasons with the Canucks, he’s averaged just under 7 shutouts per season. Our apologies for not setting a closing date for this contest, but we’ll do it now. We’ll take entries until 9:00 PM on Wednesday, January 13th. Richard, Alix and I will make our picks then and send the Canucks Yearbooks to the winners. 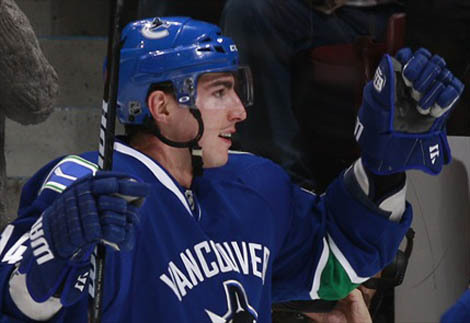 On a related note, we’re working with Canucks.com on a follow-up contest that has a tie-in with this one. More details will follow on a separate post, but let me tease you guys a bit – you want to make sure to submit your best suggestions to a line nickname for Sedin, Sedin and Burrows, and the prize for the follow-up contest are signed photos from all three players. Like my new jersey, coach? Cuz they’re bringing the rain every night! B . S . S – Brilliant Show Stoppers! Superior to the West Coast Express, and oh so Dominant. THE FULL HOUSE! A Pair and 3 goal machine! How the French framework “simple”. He was concerned about the Sedin … Perhaps the real Burrows also lit the fire!